I’ve been a single girl in a crowd full of couples for quite a while. We are a tight group that likes to get together and share meals. I was always asked to bring some beverages or some chips and dip. That all changed when I brought my deviled eggs to a cookout. All my friends have since apologized for assuming I couldn’t cook. They have mumbled around about how they thought my inability to cook might have been why I have no husband. Now, they are busy trying to figure out the real reason I have no husband. (Don’t tell them, but I really just don’t want one. It is too much fun watching them try to figure me out.) 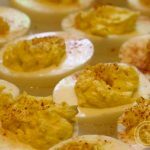 Now, when we all get together I am always asked to bring some kind of dish, but my deviled eggs seem to be the crowd favorite and I make them quite often. Come to think of it, maybe always bringing chips, dip and sodas wasn’t so bad after all. This is my twist on a picnic staple. Boil the eggs. I have my own way of doing this. I bring the water to a good, steady boil, then I lower the eggs into the water one at a time until they are all in. By adding the eggs after the water is boiling, it locks the yolks in the middle of the white, insuring a pretty presentation. After the eggs are done boiling (approx 13 min. ), peel and slice in two horizontally. Separate yolks from whites, putting yolks into a mixing bowl and white on a pretty serving platter. With yolks in a bowl, mash them with a fork until they are in small pieces. Add the rest of the ingredients except the pickle juice and mix well. After ingredients are combined well, add the pickle juice a little at a time to the desired consistency. Take two regular sized kitchen spoons and fill egg white halves with the yolk mixture. Sprinkle the tops with paprika to finish. 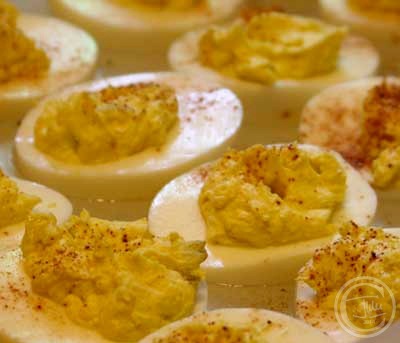 I love deviled eggs and could demolish a dish of these! Deviled eggs are a favorite with our boys, and our whole family in general! 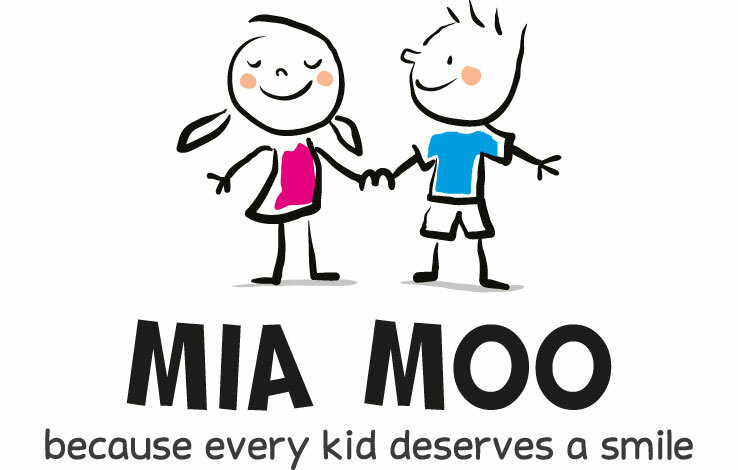 Great post, thanks for sharing. we just love them too. And spring/summer cookouts are as good an excuse as we can find!